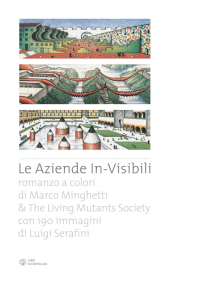 In the October 2008, Libri Scheiwllier published a romance, “Le Aziende In-Visibili” (The In-Visible Corporation), inspired by the famous Italo Calvino’s “Invisible Cities” . Le Aziende In-Visibili is a collective narrative reflection about the contemporary life in an age of enormous socio-technical trasformations. In this context the Corporation became metaphor of the nowadays human condition (as the Cities in the Calvino’s Masterpiece). The romance is illustrated by 190 images by the great artist Luigi Serafini. Le Aziende In-Visibili is written by Marco Minghetti and The Living Mutants Society, that collects 99 personalities of excellence in fields of art, economy, entertainment, as Alessandro Zaccuri, Walter Veltroni, Paolo Savona, Enrico Bertolino, Aldo Bonomi, Valeria Rossi, Alessio Bertallot, Gianpietro Vigorelli, Gloria Bellicchi, Francesco Morace, Armando Massarenti, Pier Aldo Rovatti, Giulio Sapelli, all well known in Italy.